Fast Solar Charging with SunPower solar panels - Solar conversation efficiency transformation up to 22%-25% It transfers solar power into free energy.Where there is sunlight,there is electricity.The solar absorption and transformation is higher than normal solar panels in the market.It offers an effective and major way for cellphones charging when you are outdoors. Emergency External Battery Backup - 10000mAh capacity integrated Li-polymer battery,this solar powered phone charger could charge itself under the sunshine,as a backup emergency power bank.This solar power bank is perfect for hiking,traveling,camping and anywhere you have direct sunlight. Universal Compatibility - Compatible with iPhone 7,iPhone 7 Plus,iPhone 6/6s,iPhone 6/6s Plus,iPhone 5/5s/SE/5c,tablets,iPad,Apple Watch,Samsung Galaxy S8,S7,S7Edge,S6,S6Edge,S5 etc smartphone cellphones Androids mobile telephones Gopro Camera,GPS MP3 and more devices. Dual USB Smart Charging Technology - build in smart IC chip for each USB port to charge two devices simultaneously,which can intelligently identify the device and maximize its charging speed while protects your devices from over charging and overloading.The backside bright LED flashlight is perfect in darkness,especially for emergency. 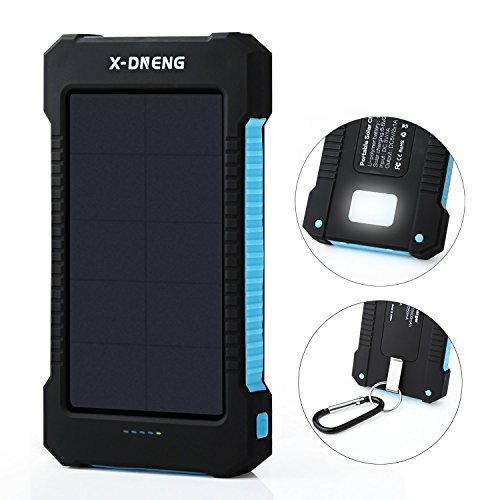 Portable Compact Design - Easily fit into your bag to provide instant power.Suitable for a wide range of occasions like travel,road trips,hiking,camping,parties,BBQ and outdoor activities.